Over the last few months, we've searched high and low to bring you the best Family and Educational games from across the globe in a variety of subjects and categories. Today, we're giving you an insight to the world of Mathematics! So...why is Maths an important part of life? Maths is used by all of us every day (whether you realise it or not!) Baked a cake? Redecorated? Done a bit of gardening? Basic Maths skill in essential a loads of every day activities and getting it right first time is invaluable to growing up. Of course, there's nothing wrong with brushing up your skills throughout your life! Here are our Top 5 New Maths based games for you to try! Outmaneuver your opponents in this full-tilt action brain-builder! Arrange your tiles in Skiwampus so that the corners connect to form an array of patterns, whether most colors, all numbers, three of a kind, or more. But work quickly because everyone plays at the same time! It's a geometric jam that requires sharp eyes, quick thinking, and nimble hands. Let the wild Skiwampus start! Like Katamino? You'll love this! Players compete on the same board and race to fit the different shaped pieces into the correct places. Not only is this a progressive brain-teaser, it plays in duel between children and parents as well: who will be the quickest to fill their board space with the selected pieces? Also, try to complete the included solo challenges and explore thousands of possible combinations! The sheer amount of playing modes and difficulty levels allow multiple games to be played in a row, bringing the whole family together for memorable moments. Ubongo is a fast-paced, addictive, and easy-to-learn geometric puzzle game. Players race against the timer and against each other to solve a puzzle of interlocking shapes. The faster you solve the puzzle, the more gems you get. The player with the most valuable gem treasure after nine rounds of solving puzzles wins! Another one for fans of Katamino. The idea of the game is straightforward – go ahead and have “SUM FUN”! Use the tiles you have picked up to make SUMs. Once all of the tiles are out, the winner is the first person to use all of their tiles to make valid SUMs. The SUMs must be connecting and intersecting – similar to that of a crossword format. Click here to get your copy! The rules of Red are simple: Highest card wins! But Red is only one of seven games you'll be playing. Red7 is a quick and easy to learn card game that you can teach and play in five minutes. You must be in the lead at the end of your turn, or you're out. Play from your hand to improve your palette, or discard to the rules canvas to change the game. Click here to get your copy! We’ve searched high and low over the last few months to find new games with something a bit different to offer. We’re always on the lookout for games we know people will love and will be able to relate to. Here is a great new addition to our collection; KIX - the football card game! Two teams, 60 cards, and play that replicates the real game, moving up and down the pitch. KIX is easy to play for anyone 5 and up. - Nigel Scarfe, Imagination Gaming. You’ll progress through these rounds until ‘goals’ are scored against the keeper. How many goals can you score in a 5 minute game? The great thing about this game is the way a variety of people can play, and the way it can become very tactical. The more games you have, the more you’ll start to think about when the best time to use a player is and who is the best player to score goals at the most crucial points. If this wasn’t enough, the game gets even hotter by the alternative 11-a-side game! To play this variation, 2 packs of KIX cards are needed for the ultimate experience. There are also different rules to include which really do spice the game up a little; the greatest experience for the football enthusiast! Here's a quick video from the creator himself, explaining the game and the strategical side to it. KIX is available in store and online store now. Click here to be taken to the page and to make a purchase; stock is limited! 2016 was a great one for the Imagination Gaming awards, resulting in a fantastic outcome in different categories across the board! Over the next few weeks, we will be investigating the ins and outs of each of our categories, including bronze, silver and gold winners. We gathered a fantastic team of educators, gamers and parents who tested out the games for themselves and scored them on everything from looks to gameplay. We had a great mix of reviews and because of this, we are now able to give you our most up to date list of the best games in a number of categories. This week, we will be sharing with you our winners of the Best Maths Games. Numeracy is an essential skill, and incorporating this early on in development can introduce a world of possibilities. There are many games available today that are great for building these skills and we have tried and tested so many for the game awards. We have now awarded three different games the bronze, silver and gold award for the Best Numeracy Games available, so what are we waiting for? Let’s take a look! By being a Gold Award winner, we really were certain about this one; a collection of the most mind boggling problems that will really get those cogs turning! There are 4 different sets of logic cards for different abilities which are designed to really get you thinking. Each card has a difficulty rating, so why not start at a comfortable level and work your way through, making it harder and harder each time? Challenge yourself and increase your brainpower! Logic Cards are fantastic to use in schools. The various difficulty rating makes is really easy to find a suitable challenge for any year group and would be beneficial to use in a Numeracy activity. We also love how family friendly the cards are; really compact and great for testing your family members or children. The cards provide hours of fun, enabling you to improve your mathematical and logical knowledge in an uplifting way! Our minds were really put to the test when we looked at this game from Brain Games, and we loved how many challenges we faced. Questions about time, shape and number got us thinking. We loved how simple the cards were to use and we thought they really worked well for different age groups. We found quite a few cards that even made us stop and think, and we were all adults! Another great feature of the Logic Cards is that each card can be used through an App; Logic Cards augmented reality! Simply download the App using the AppStore or through GooglePlay and see animated solutions to the cards you have tried! Did you solve the puzzle correctly? We think this is a very clever way to see the different solutions. Gold Award is definitely deserved for this one! Click here to check out our store for all Logic Card packs available. Being a Silver Award winner, Code Master really doesn't disappoint for it's unique gameplay! Ever wanted to have a taste of programming? Well, this is a definite fun way to do just that. Being a single player game, Code Master is that little bit different to others. It requires you to navigate your Avatar around the map, but only a certain sequence will bring you success and lead you to the end portal. Don't forget to collect all the crystals along the way! Code Master is a great example of a game that introduces concepts of programming and logic puzzling for KS2 and upwards (including adults, of course!) It's a fantastic solo game/puzzle that can cater for a range of abilities, from those that may struggle with these concepts to those that really excel. Another brilliant release from ThinkFun! Our panel of judges tested this game and thought it really was something else. We loved the challenge of problem solving and sequential reasoning; some of the judges had never been quiet for so long! It really enabled us to think, and all these reasons combined was why we gave Code Master the Silver award. Click here to check out Code Master in our online store. 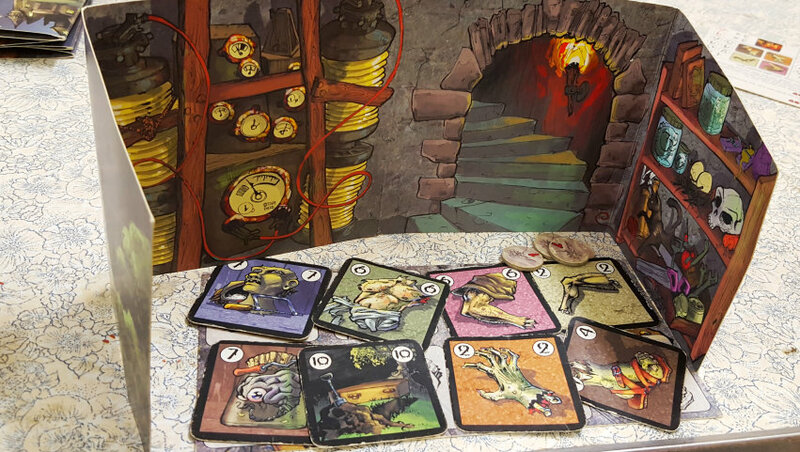 Bronze Award was given to this fantastic number game from ThinkNoodle, bringing Zombies into the world of Maths! This great release can be enjoyed on its own or as an expansion to the already hugely successful City of Zombies; the ultimate mathematical challenge! Use the dice given to add, subract, multiply or divide in order to take out Zombies. Multiplication skills are sure to improve, with the game covering times tables to 12 and beyond! Times Square encourages players to use different operations to win the game. Children can team up together and co-operatively play to practice and learn their times tables. It's great for children who find multiplication difficult and also for those who simply love maths and numbers! Children in KS2 and up will benefit greatly from this new addition. Our team gave Times Square a Bronze award overall; we loved how we could play the game on it's own or with the original City of Zombies game, giving an even greater experience. The game is fantastic for Numeracy in schools and can be enjoyed as a family game to boost those well needed skills! Click here to view City of Zombies: Times Square in our online store. The idea is to use and create some games and activities that introduced some basic financial literacy skills, particularly aimed at engaging and educating a group of 8 to 13 yr olds with varying abilities in this area. The activities are part of a drop-in evening session at one of the many local community centres where Breeze Leeds run regular events for the age group in order to engage them in fun activities outside of school, and introduce them to new ideas and inspirations whilst developing key knowledge and life skills too. I love seeing kids being able to make their own choices and take their own risks playing these games. Having fun whilst learning - isn't that a youth workers dream?! Financial literacy isn't just about about adding and subtracting amounts of money. Of course that's the important basic, and for many, the key area to work on. Confidence in knowing what you have, appreciating what something costs and most definitely knowing you've got the right change back from the shop-keeper! Beyond that though, are other skills such as worth and negotiation. Understanding the value of something rather than just the cost is a crucial skill. Not just 'is it worth buying', but, 'is it worth buying now'! Clever negotiation and appreciation of value are the higher level skills we want to be able to explore too. Often in games, just as in life, good money management and communication is about getting a bargain... and that's where all the fun is! As always the first thing is it has to be attractive, interesting... fun! You can have the best resources in the world when it comes to teaching, but if it doesn't look good and be quickly put to use, you're going to struggle! Then it has to be appropriate. I thought it was amazing because it was a bit like trading cards - they look cool! Here you not only have to consider obvious factors such as age and ability, but the number of players, the time you have and the accesibilty of the game, do the players need to understand something new just to be able to start (and if so, can you make that part of the game?!). Now multiply all that by the fact your group is not only varied in these skills but have short attention spans, other things happening in the same room and can come and go as they please... very hard to plan for, so you have to have plan A, B, C ... and be ready to be flexible! 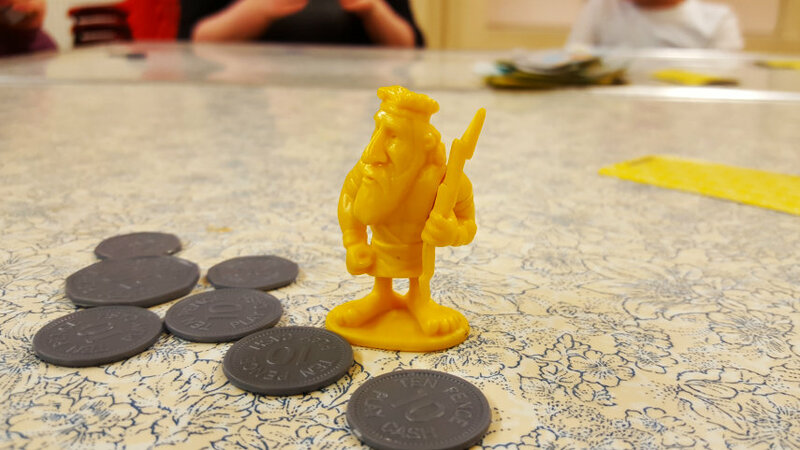 So, we concentrated on using some simple games to start with, not necessarily involving money at all to start with, making sure we grabbed the attention and laid the foundation for more to follow. Some games had money / treasure as part of the game, other times we added a financial element to a game that didn't have one. Sometimes it wass just about value and risk. 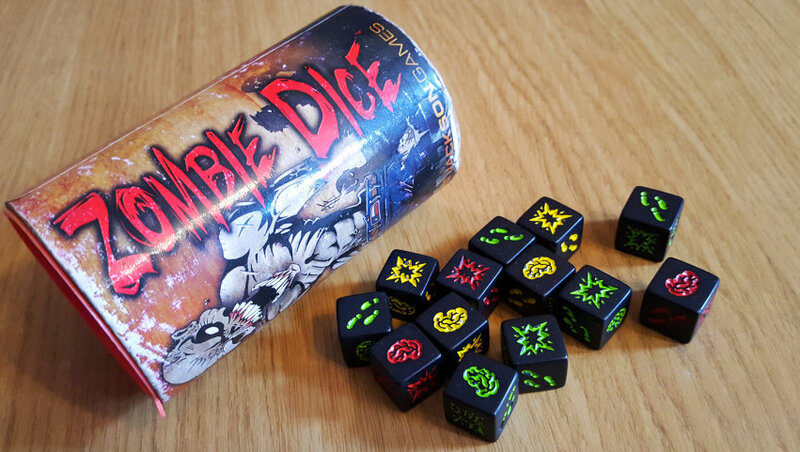 Zombie Dice is a simple and accesible little dice game that's quick to play, easy to understand and all about risk management. This is a great game to get started with and has become a firm favourite at every session, perfect to warm up or cool down with! My favourite game is Zombie Dice. It makes me a bit sad when I am risking it and get it wrong, but it makes me think more carefully about how to get brains! The theme is perfect for gaining the interest of this age group, so engagement is really easy. Each player simply has to roll dice and collect brains (it's a zombie game what did you expect?!) After each 3 dice rolled each player must decide whether to stick and keep the brains (points) they have or risk losing them if further dice don't go their way. Simple, but amazing how it can help to develop a keener sense of risk and probability in younger minds, andbegin to quuestion the value of their short term desires against what is best in the long run! 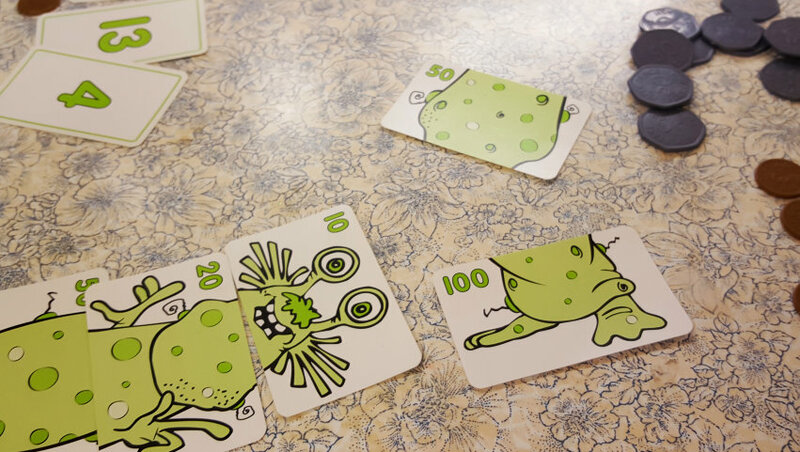 The cards in Monster Maths were perfect to associated with coins - with the numbers you have to make being 10, 20, 50 and 100. Normally players use random number cards to create a sum to equal one of these target numbers and get a part oof the monster towards creating a whole monster. We simply rewarded them with the equivalent amount of money for their pot as well, whilst giving them the option of spending money on more number cards to help make the task easier, perhaps! 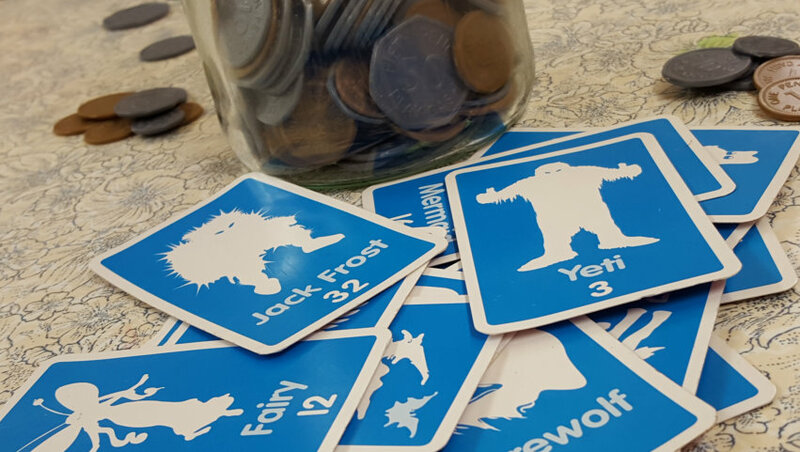 They had to decide whether it was worth spending money on cards, or even duplicate bbody parts, to make more before someone finished a monster and we found out who had the most money. We messed with Mathical Creatures a bit more! Rather than making sums to match and collect different value creatures, we gave them each an amount of money to spend. Each time they 'bought' a monster they would have to perform the money transaction and get their change, but more tactically, try and buy a team of creatures to help them win in a final battle against other teams of creatures, where the higher your monster in each battle the more money you could earn / win. This one became very tactical and after the first game, players were much more thoughtful about how they spent their money! I thought the game was very interesting, I definitely enjoyed playing it! I love games that make you think and are based largely on logic and tactics. I also think they're great to help kid's maths skills. It's Alive is a game that's been out of print for a few years now, but we use it because it's another one that the kids simply love the look of... and it's a brilliant game about buying, selling and auctioning! Players have to act as the Mad Scientist while they use their gold and silver coins wisely to try and purchase enough parts to build their 'Frankenstein' monster. You have very little cash and body parts can be cheap and expensive, so thhis one really is about knowing when to buy and sell, but also the worth of selling something at auction, setting the price to make sure you get the most money you can. A brilliant game that we wish we could get more of! I loved playing that game (Wildlife Rescue) because it has animals in it... I thought this (It's Alive) was an interesting game because it was gross!!! This one is usually for the older players, but taught in the right way we've found that younger players can absolutely love it too. Again the artwork is immediately engaging, as is the name! 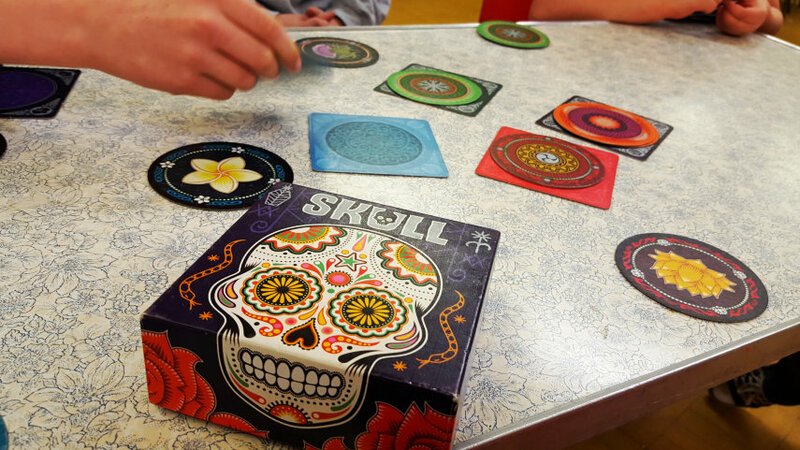 It is a bidding game where players simply play cards in secret before daring each other as to how many of the cards on the table they can turn without finding a skull. A couple of very simple but clever rules make this a very strategic and entertaining game of bluff, with lots of tension and laughter. Until of course you find a dreaded skull. Simply another great game for highlighting caution and judgement as valuable skills, and that diving in isn't alwayys the best way forward! I quite enjoyed the game Skull because it was quite complicated (at first), but once I got used to it, it kept beng fun! I like this game because I got to steal Zeus and make money!!! There are still several sessions to go on this project and we will be introducing other games such as Incan Gold, an Indiana Jones style treasure finhing game, a BrainBox quiz and a money based leaderboard for an old favourite with a twist - Take It Easy. It's great to see how confidence increases and the young people get more daring as the games go on! Imagination Gaming brings fun, smiles, independance and spirit to the young people. It's a fab way to learn maths, strategy, tactics and decision making. Clearly we can't wait for the next games session!